Baraboo Superintendent Lori Mueller told The Associated Press she became aware of the photo Monday after it was posted on social media. Mueller said the photo appears to have been taken last spring and wasn't on school grounds. The photo doesn't reflect the district's values and that administrators will pursue appropriate action, Mueller said. The district sent a letter addressing the photo to parents and guardians Monday and is investigating the photo after it began making the rounds on social media. Baraboo police are also investigating. Morgan Springer graduated from Baraboo High School in 2018 and said she was there when the photo was taken. She said the photographer asked the boys to "give some kind of like 'Yeah!' symbol" but she didn't believe the photographer indicated they should do the Nazi salute. "About 99 percent of the guys all shot up the Nazi salute," Springer wrote in an email to WPR. "I personally knew a few of the students, who are current seniors at BHS who didn't do it ... They were all shocked that it was even happening." "Even as they did it and pictures were being taken, nobody tried to stop them," Springer added. "Parents and even the professional photographer just kept taking the picture and were even laughing because they were looking at it as a joke and even saying, 'Oh, those silly kids.'" A mother, whose child attends Baraboo High School, said she has heard the gesture meant something different. "I actually know parents of the students who are in the picture and there was understandably some concern from some of them," said the mother. "And some of the kids were like 'No, you don't understand, that's not what it was.' If you go to football games on Friday nights, you'll see all the parents, all the adults, all the cheerleaders doing the Blue-Gold, they put their hands like that. Other kids were like 'Yeah, it was kind of confusing.' Some people said it was one thing, some people said it was another." The mother, who asked WPR to remove her name from this story because she said her children were being harassed, said she's more concerned with who posted the photo and why it has resurfaced on social media months after it was taken. She said the school district should not be held responsible for the incident because the photo was not taken at the school or during a school event. Isabelle Martin, a former student at Baraboo High, said she's heard some of the students say the gesture was meant as a wave, but she doesn't believe that explanation. She said the school district should take action. "It was taken before a school event. They should be talking to the students because it's more likely happening in the hallways, too," Martin said. Martin said she witnessed students making racist comments in the hallways during her time at Baraboo High School. Springer echoed Martin, saying Baraboo High School has a history of racism. "One thing is for certain: Baraboo is filled with racist and ignorant people," Springer said. "The staff at BHS try to claim that these actions don't represent BHS as a whole, but nobody from the staff has ever tried to amend these problems ... Whenever this stuff happens, they just say, 'Oh, that was a bad thing,' and everyone forgets about it. It's honestly really sad." Wisconsin's Democratic Gov.-elect Tony Evers said Monday the actions of the high school boys have "no place in Wisconsin." "As elected officials, we have a responsibility to lead by example for a generation growing up in a climate where they see this behavior condoned," said Evers, who is the state schools superintendent and defeated Republican Gov. Scott Walker last week in the governor's race. Evers said he will be in contact with Baraboo school officials and "intolerance and bigotry must never be tolerated, in our schools or anywhere else." The picture has received widespread condemnation. 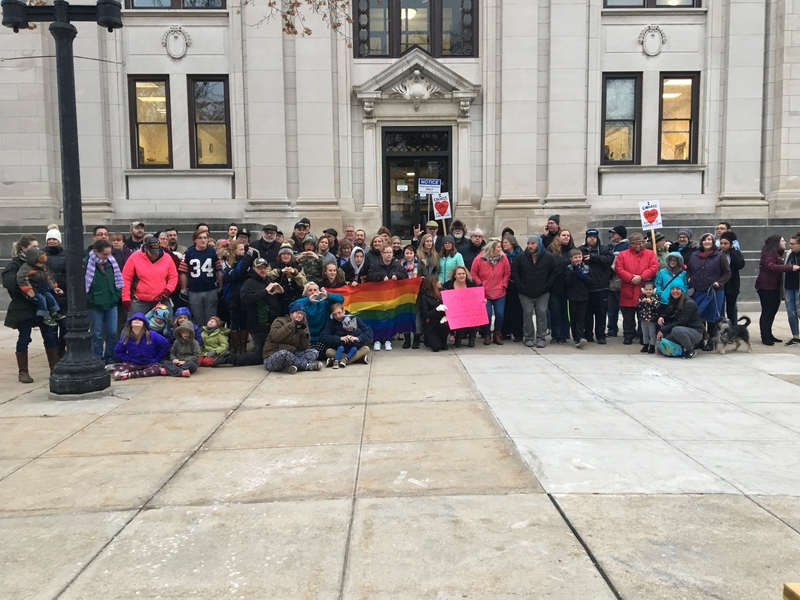 On Monday afternoon, a group of about 70 people gathered outside of the courthouse to denounce the original photo and take their own to counteract the negative attention the Baraboo community has received. Hadley Kalish, 12, came to the rally with her mom and carried a sign that said "love, not hate." She said she was disgusted when she saw the photo Monday morning. "When I saw the photo, I got really angry, just because I think nobody should ever do this because of what happened and how many people got killed," Hadley said, referencing the millions of people who were killed during the Holocaust. "It disgusts me," Hadley said. "I hate that this happened." The Auschwitz Memorial tweeted the photo is why it works hard "to explain what is the danger of hateful ideology rising." Editor's note: This story was last updated at 6 p.m. Monday, Nov. 12, 2018 to include comments from a Baraboo rally Monday evening. The identity of the student's mother was also removed because of safety concerns.